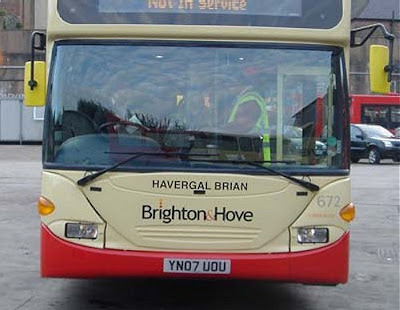 Havergal Brian's music may not feature in the 2010 BBC Proms season, but as a consolation prize the composer has had a bus named after him in Brighton. He joins other musical celebrities including Ralph Vaughan Williams (no symphonies at the 2010 Proms and just one more performance than John Foulds), Frank Bridge (no music at all at the Proms), Albert Ketèlbey (ditto), Dusty Springfield (well OK) and the WHO (that's a good idea) whose names adorn Brighton's bus fleet. The full list of named buses is here, we can only speculate why certain names (including Queen Elizabeth II and Prince Philip) are no longer displayed. Thanks go to reader John Shimwell (who brought us Noddy and Berg's ears) for giving us the ticket to ride. Don't get me wrong, I am a fan of Havergal Brian. But I wonder whether his bus works a very long route? More on the composer of 'The Gothic' symphony here. Somewhat cruel that you left the "not in service" notice visible on the destination plate. Actually John I noticed the "not in service" sign. I just assumed the bus was on its way to the Royal Albert Hall. To continue the Havergal Brian/public transport connection, he left the original manuscript of his violin concerto on a train. It was never recovered, and he had to reconstruct the piece from memory. Weird synchronicities abound here. Unless things change, which they usually do, Her Maj is scheduled to make another very rare appearance On An Overgrown path here.